VENT Volume 1 is the 10 year anniversary art book for UDON Entertainment. UDON's an art studio that have been around for a while now. You might know them for their Street Fighter comics and art. They have worked for for Capcom, Marvel, Hasbro, TV studios and many other big clients. 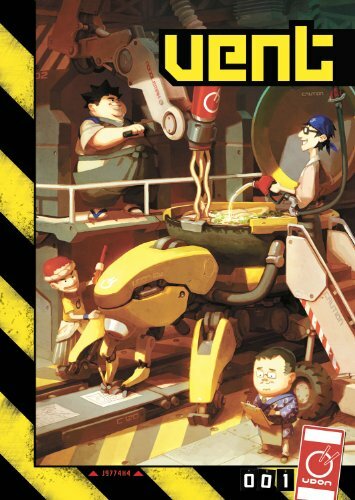 This 248-page paperback anthology that features the comics, illustrations and tutorials from the talented UDON artists. The illustrations mainly character based, and beautiful, of course. It's very refreshing compared to their commercial work, as many are published for the first time. The art feels very different as there are lots of new characters, designs and stories. There are 28 artists featured so the variety is very varied. About a third of the book is on tutorials detailing the creation process. That is a lot of tutorials and they are filled with step by step screens and commentary loaded with tips on digital and traditional drawing. It's all interesting to read and they are really useful for artists. You can learn how their achieve their manga-like colours, conceptualize designs, composite layouts, among many other art creation ideas. This is a wonderful book of art and tutorials, recommended to fans and artists. This book was borrowed from Basheer Graphic Books for review purposes. You can order the book from them. Check with Basheer on Facebook or visit their website. I recieved my copy yesterday. I recieved my copy yesterday. It's really good book. Good print quality and lot of images and tutorials. Saw this at the comic shop in bugis junction but couldn't browse the inside. The cover artwork is really compelling, but seems like the stuff inside is quite varied. The tutorial for the cover artwork makes this book quite tempting though. Thanks for the review Parka!